Book About Faces for your event today! The snow has reluctantly disappeared and it's begun to sporadically rain, with the smell of dead worms adding April flavor to early morning walks. As winter melts into spring, dreary weather gives way to the promise of dreary holidays. I mean, really, what does April give you to look forward to? Tax Day? So, with your schedule accordingly open and your day-to-day routine consequently boring, it's time to get planning. Maybe April isn't exciting, but magicians and caricature artists are! After all, the season of company picnics is on its way, and now is the time to book your entertainment. 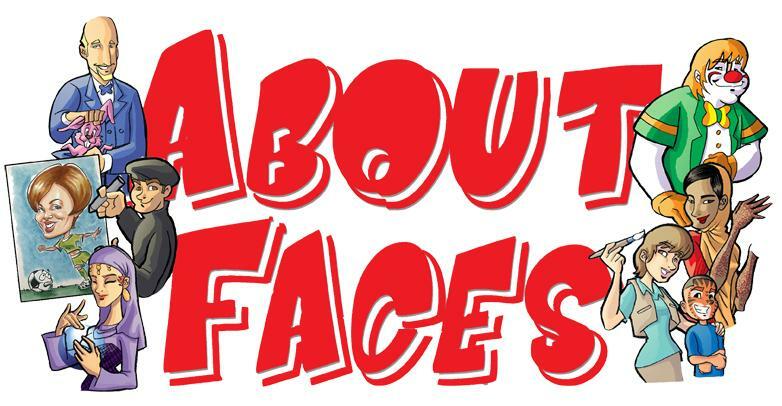 Not just any entertainment -- About Faces Entertainment! A world of entertainment, from henna tattoo artists to face painters to balloon sculptors, awaits you. Visit our website to view our artists' work and rates, and to choose your perfect entertainer! 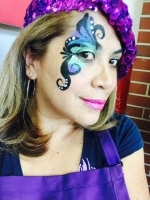 Our event manager said the face painter [Picassa] was amazing! She was very professional and so easy to work with. The children at the store grand opening loved having her there! Thank you again! I just want to inform you how awesome your caricature artist [Josh A] was! Everyone loved him! We look forward to working with your team in the future! 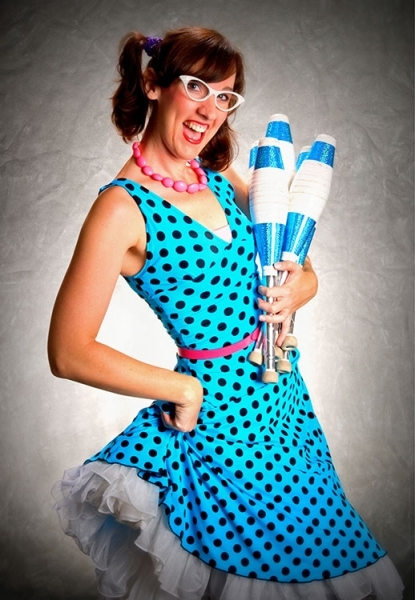 April's Featured Entertainer: Erin G! It's time for the bimonthly segment about an outstanding About Faces entertainer, and this month's is Erin G! Together with my husband Ray, I perform in a Comedy Variety Show and specialize in stilt-walking and strolling juggling. I remember my first role as a ladybug in the school play in 2nd grade. They handed me a microphone and haven't been able to pry it loose! From that debut, I was bitten by the theater bug and spent most of the next decade or so performing in anything that let me be onstage!. In my early 20's, I auditioned for a performing program on Royal Caribbean Cruise Lines called the Krooze Komics, which featured a team of variety performers who interacted with cruise passengers on their seven largest ships. I was accepted and realized I should have been a variety performer all along! On the ships, I learned how to juggle and walk on stilts and had the time of my life exploring exotic ports during the day and making people laugh at night. Through the Krooze Komic program, I met my future husband and made friends around the world. After RCCL decided to end the program, I took my skills to dry land and have been performing full-time as a juggler/stilt-walker ever since. Someday I may get back into theater, but I absolutely love the creative freedom and flexibility of being a variety performer. Through this crazy profession, I have been able to travel the world performing, directing and teaching circus arts. One of the most memorable events that comes to mind was when my husband and I were invited to perform our show at a huge festival in China! We went over with 30 other performers and had a wonderful time introducing the people of Hangzhou to American variety performing. Chinese circus performers are mind-blowingly skilled but our combination of tricks and comedy was new to the audiences we had there. It was an amazing feeling connecting to huge crowds of people and making them laugh when we had no shared language. I LOVE my job! I get to celebrate with people and make them smile every day - it's a pretty wonderful way to make a living. Wait! Don't delete this yet! There's one last thing you've got to do: Call 1-800-92-FUNNY or reply to this email and book your entertainment right now!